I just wanted to take a moment to say thank you for your organization. 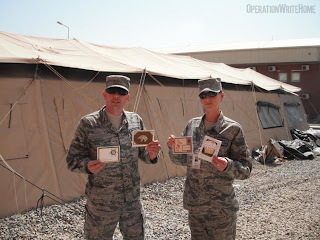 From a guy who doesn’t take the time to write much… I found your cards at Kandahar AB, Afghanistan and took the time to write because your cards were so nice. I have had great response from home because of your efforts! Thanks for making the war effort just a little bit easier for me and my family. 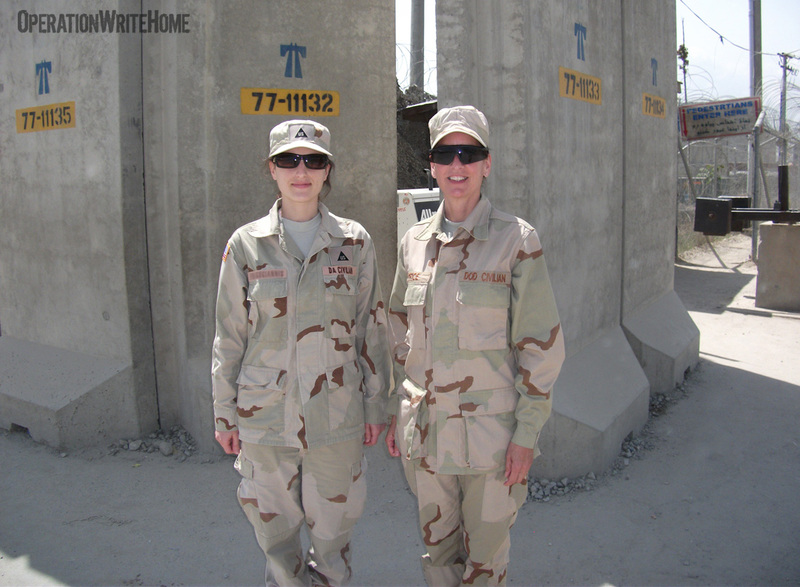 I'm a current member of the Texas Army National Guard and wanted to thank you for your charity. I just sent today 6 cards to my family. All those cards were from your organization. How thoughtful of you to take your own time to make us such beautiful cards...I love each one of them. Thank you and I greatly appreciate it. If it wasn’t so ironic, I’d send you a thank you card back! I received the box of cards yesterday and the Marines & I just love them. We really appreciate all of your efforts and thoughtfulness. If it wasn’t so ironic, I’d send you a thank you card back! ;-) It’s Sunday and we had a “reading break” which was very entertaining. My daughter and son absolutely loves receiving cards from me and your organization has made that possible. So again, from my family to yours, Thank You! Congratulations to Pvt Ciara on her new promotion! 5-6 weeks for a new box of cards would be great and a large box would be greatly appreciated. We get a lot of traffic in our office and we like to share with the other Marines that might stop through. I received the box of cards yesterday. Thank you so much. I can tell you that they are a HUGE hit with my company. That box that you sent is already halfway gone. I really appreciate your team helping out and doing what they do. I am impressed with everything. When I get a card I am amazed at the detail and time put into each card. As for Pvt Ciara, that is awesome. When I saw that picture I was reminded of my friend's golden retriever named "Wrangler." Please let me know if there is anything that I can do to help as well. We are here untl at least December. This is my 3rd deployment here. Well once again, THANK YOU and God bless. I got the second box of cards yesterday. :) It came just in time because I was almost out of cards for my kids. I don't get to talk to them much on the phone, so these beautiful cards are my main means of communication with them. Please tell your friends "thank you" and "congratulations" on your millionth card. Please pass on an extra-special thank you to little David for the Noah's Ark card. * It is really nice. He made me smile with all the animals and the great work he did with the drawing. Also, tell Lainey** I think she is super-strong for carrying that big box all by herself. I hope your foot is steadily improving, and thank you again for the cards. My kids love them. nice to send them a note every now and them that is 'age appropriate." Dixie, thank you for the wonderful memories these cards create. meaning it has to all the families you touch! God bless you and our military! Thank you for supplying my son, Maj J.C., Kabul Afghanistan, with my beautiful Mother's Day card. On behalf of myself, and my entire team here ..., thank you! And thank you to all the wonderful people involved with Operation Write Home! Your cards are beautiful and gave us a much needed pick me up this week. As you can imagine, it is easy to get caught up in the nonstop work over here, but your cards gave us a great reason to take some time and write to our loved ones. So, thank you. I am sure our families will love the cards that we get to send to them because of you and your organization. It is great to know that we serve such an amazing Country, with amazing people like the ones involved with Operation Write Home. I trust this missive finds you and all of the card makers well. Please pass along my thanks to everyone (especially Nancy)! Thank you so much for the wonderful cards. My heart fills with such happiness and joy when I get a card from my deployed husband. The excitement is priceless on my four year old daughter's face when she receives one from her daddy. This is all possible because of the donations from your organiztion. Thanks to all of you!!! I will keep these cards for the rest of my life and re-read all of the wonderful things that he wrote to us during the deployment. He even sends cards to our now 9 month old twins that I will read to them when they get older. They were 5 months old when he left and will turn one before he gets home. Box arrived, near riot ensued. I just wanted to thank you so much for the cards! They were such a hit and are still flying off the shelves! The handmade touch is such a treat for the guys here... We really appreciate all that you do! Thank you so much for the cards! I will definitely take another box and then I should be good. Great picture of your dog. I have 2 German Shepherds myself and my wonderful husband is taking care of them! so its possible you may receive specific requests in the coming weeks! BTW, PVT Ciara is adorable. Thank you for the pic! P.S. Attached picture of Effie and I for your amusement. I received the box of [welcome home] cards in the mail today. These are some of the most beautiful cards I've ever seen...and that is no exaggeration. I don't even want to give them away...lol. I want to frame them and decorate my house with them!! The soldiers will LOVE them!! Please feel free to follow my personal blog (www.4ourmilitary.blogspot.com) where I share all my experiences online. 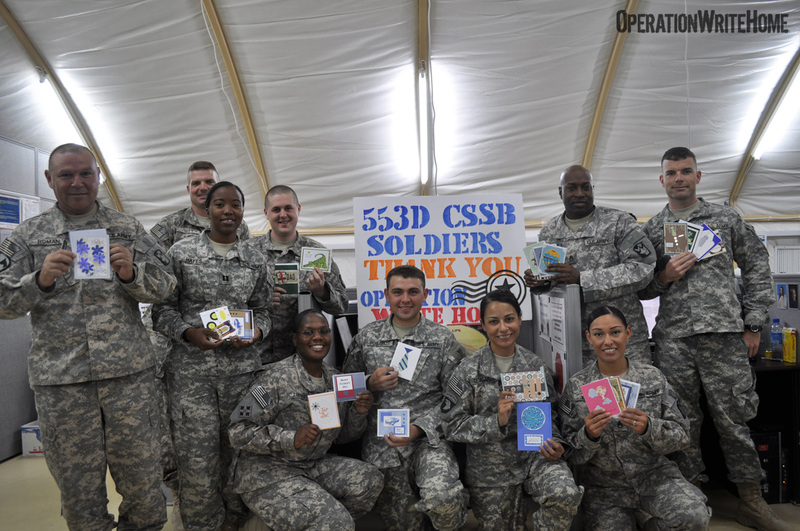 Again, thank you and all your cardmakers for helping to make our soldiers' homecoming that much sweeter! Thought you might like to share this with the others, this is my husband on the left and a friend on the right holding out OWH cards!!!! I received a card shipment for my unit from Operation Write Home – THANK YOU !!! In the package was a Mission Statement flyer and a note to me from “Kris”. I wanted to let you know that I received the package and appreciated it. It was shipped to me in Kosovo. Brenda C., one of our card makers, got this nice email from a Hero! Thank you for the beautiful cards you make for us to send home to our friends and family. I was speaking with my sister the other day on the phone and she thanked me for the card and told me how beautiful it was. Then she asked me if we make them here. I quickly explained that there's a special group that makes them and ships them to us so we have something beautiful to share with them. I send them to my daughters and they love getting them as well as my husband, sisters, brothers, nieces, nephews,mother, father, and friends. Thank you again for all of the time, effort and money you put into these wonderful works of art for us to share with others. Hello Pat, I just wated to write a short thank you for the work you do with making cards for troops to send back home from Afghanistan. 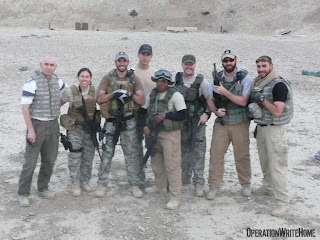 I thought you might appreciate knowing that we find the work you do usefull and helps us to stay in contact with our family and friends back home. I am a British officer in Kabul working alongside your fellow countrymen and am impressed by the support the US population give to their troops. The card I sent was beautifully crafted and I am sure my wife will love receiving it. Thanks again. Thank you from My brothers and Sisters here in Iraq. Just wanted to say thank you so much for the cards. They are going like crazy –everyone loves them!! I swear less than half of the box is left. I have only had them since Monday! Most of the Fathers Day Cards are taken!! It was perfect timing!! We look forward to your next shipment!!! Attached you will find picture of 553rd Soldiers Thanking you!! Once again – Thank You!! !